Joey, a writer in his 30s was going through a major creative crisis after he shifted to his new apartment. He never had an experience of staying in a skyscraper, his room had a balcony but he couldn’t see anything but few walls and a faint corridor. He couldn’t look down as he was extremely fearful of heights. He constantly cribs for some sunshine and fresh air but the space around the city is already so polluted that he hardly felt like going outside. Whenever he goes to work, he wears a mask; he takes his cab directly from his apartment which drops him in front of his office. The city is run by few mercenaries; the government has already fallen after the uprising. The metropolis where he dwells is now under constant security radar. Away from the current milieu, Joey dreams about living in a place that had everything. From water to food, from greenery to friends, the constant progress of human life has made the planet so lifeless that Joey always felt suffocated. The society where he stays had few oxygen cylinders left, while water became so expensive that he couldn’t afford. Joey avoided those self-driving cars to commute as they became very cruel. The androids handling the cars were mostly arrogant by-products of the city’s topmost management. Those cabs always cancel his request as Joey is for all time few minutes late hence he preferred those old country cars driven by humans which became a rarity after the civil disobedience. Most of them are either killed or deported to some other place to work for the androids. Joey is the only human left in the advertising agency where he works. Most of the employees are either androids or holograms of dead copywriters. Joey never showed his disapproval to the machines while writing the advertisement for products which are used for the new breed of humanoids created by them. Actually, he can’t because he is a minority in the place. The humanoids are superior beings, they have powers hence they are the target audience for most of the companies. Androids are utterly cold-blooded machines; they have algorithms for designing billboards, and the TV commercials. Humans are staying in few degraded societies. The city where Joey stays is touted to be the most advanced place. Few humans were left to work in the city because they had the power to feel the emotions, unlike the androids. 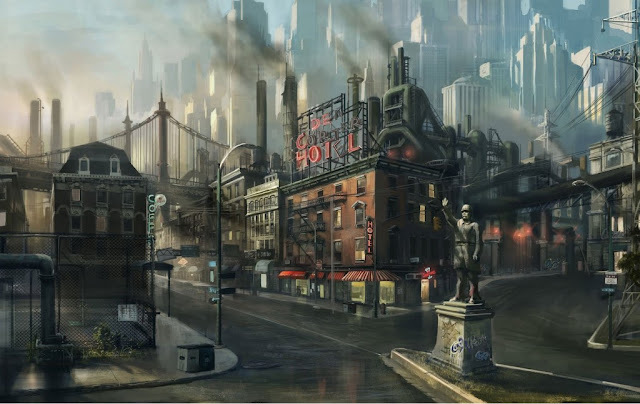 The humans in the city were some kind of lab experiments for the mercenaries to understand the emotion mechanism. Joey and other humans were interrogated and tested regularly. They were just scientific projects for the androids. Most of the developed countries are already taken over by the machines. The onslaught of these superficial beings kept increasing as they started manufacturing huge army for conquering the mountain people, the tribes that never allowed the machines in their territory. Those places were marked extremely dangerous for the androids because they have snake poisons that could destroy the machines within a second. The mountain people are living in peace however they are warned for not embracing new technologies. Joey always wanted to be a part of them but he wasn’t allowed to cross the territory. Life for Joey is just about survival, to teach emotions to the androids although he knows he will be destroyed after they learn the skill from him. It was 10 am in the morning and Joey was ready to go this workplace so he called his driver who is also human. “Hello Sam, will you be able to take me to the municipality office after my work?” - Joey asks him restlessly. “Yes Sir, why not? I will be there in front of the office at 4 PM” - Sam says. At 4 PM Sam picks up Joey from his office and starts his trip to the municipality office. “Are you having some important work sir?” - Sam asks Joey as he hardly goes to any place after office hours. “Yes Sam, I want few documents from them. My colleagues need them for some research work. I already spoke to them and do you know there are few humans as well. They are working there as security personals. It would be fun to meet them too.” - Joey replies with excitement. On the way to the place Joey asked Sam to stop at a location that looked like a library. Joey was surprised to see the library name dedicated to his idol who was a futurist. Joey enters the library and sees lots of books instead of empty spaces with big screens. The quaint-looking old librarian walks towards him and asks him about his favorite book. Joey couldn’t remember the last time he read a novel however he managed to tell him about a writer who was lately killed by some alcoholic android in a pub. The librarian gave him a book called “Beyond Humanity” as a gift and walks mutely towards the door. Joey saw few shadows of androids walking towards him from the back door so he decided to leave the place as soon as he can. “Are you done, Sir? Shall I start?” - Sam asks Joey with little discomfort. On the way to the municipality office, Joey couldn’t see any android in the streets. Sam began to drive faster as he saw few self-driving cars trying to bully him by constant honking. “Those cars are possessed by the most powerful androids of the city hence you have to be very careful while driving. There are many cases of road rage where many humans are killed because they tried to drive faster than the androids.” - Joey warns Sam to drive slowly. The municipality office was still too far. During the journey, Joey and Sam talked about many things from new scientific discoveries to the downfall of mankind. “Oh look, that’s a river?” - Joey points his finger towards a beautiful river which he never expected in the city. “That must be a virtual one” - Sam says with utter disgust. Wait, let me check? Joey gets down and starts walking towards the river and saw fishes and birds. He went further and saw real water. “Hey look, Sam, this river is real!” - Joey holds few water drops and tells Sam about the reality. Sam didn’t reply anything but asked Joey to come inside as they are getting late and the office will surely not entertain them after it’s closed. Now they are almost near the municipality office, Joey felt relieved as he on time and there’s still some time left. The municipality office looked like a country style house and full of humans. It was very surprising for Joey to see so many people there and the most shocking thing about the place was there were no androids. Only humans and all looked very happy. The office had no computers but only files fully cluttered space and few telephones that look so archaic. Joey couldn’t believe that a place like this ever existed in the city of androids. After taking all the documents, Joey called Sam to take him back but Sam didn’t pick up his call. Joey tried to find him but he couldn’t be seen anywhere. “No Sir, I haven’t seen anyone around” - the employee says with a polite smile. Joey kept searching for Sam throughout the campus but couldn’t find him so he decided to book a self-driving car instead for going back home but he couldn’t find the app for booking machine driving cars. “What is happening?” Joey was shocked to see more and more humans around him. “What is happening with me? Am I hallucinating?” - Joey asks himself. “Hey, where are you from? - An old lady, asks Joey. “I am from the city” - Joey tells the old lady. “Why you have those metallic eyes?” - The old lady asks him. Joey after saying that suddenly collapses. His body parts were dismantled by the human security guards. Joey never lived in a city of androids; he was very much amid the humans. The whole country is still very much lively and there was no onslaught of machines. The transformation of Joey from a human to an android was a part of Joey’s own experiment that he always regretted. He wanted to get back to the reality but his transformation made him numb. He was highly influenced by the technology. Sam was not human too; he was only Joey’s hologram who always accompanied him to the very humane workplace he worked. Joey’s extreme greed to incorporate the expertise of machines actually made him a lesser human. He was unable to feel anything. He often visited the place that he called lab was actually a psychiatric centre which was trying to instill human values into him again.